The Cost Of A Cup Of Tea A Day? I have limited amount of spaces for people who truly desire to get in front of thousands of brides and couples at Alice In Weddingland and I want to give you the opportunity to be a part of it. More Brides & Couples Without The Marketing Headache. Do you find it difficult trying to find new clients or frustrating that you can't find the time to 'work' and instead spend endless hours marketing your business? Where you'd just like a simple proven way of attracting new brides and couples without the headache of constantly having to 'market' your business through every 'social-media channel out there? "the reason why you started your business!" - struggle, worry, and frustration that comes with marketing and trying to find new clients! One where you'd have the total peace of mind and security in knowing that you wouldn't be thinking about your next payday. or trying to work out 'what's the best system' for getting new clients! If this sounds like you, then you're in the right place. Welcome, my names Zarn and I run Alice in Weddingland. A unique Wedding Blog that attracts Brides and Couples from all over the world looking for unique inspiration, ideas and wedding suppliers just like you. Where you can spend time with your kids, your family and friends knowing your business is safe. Where you don't have to worry about whether you're going to have to go back to full time employment again. A little over 3 years ago I started Alice in Weddingland and in the first 6 months Alice in Weddingland grew with a meteoric rise and before I knew it I was offering sponsorship to my blog to wedding suppliers just like you. Where you could get right in front of the brides and couples that came to Alice in Weddingland for their ideas. an indulgence in elegance, style and beauty with a twist on the modern and traditional wedding. A place for brides looking for something classy and cool. NOTE: At this point you might think I'm about to sell you just a 'banner advert' or just a 'sponsored post' on the blog - but this would be further than the truth! Initially like every 'wedding blogger' out there (because I was new and naive to the advertising on wedding blogs stuff) I offered banner adverts as a way for wedding suppliers like you to get in front of my brides and get business. And this is what I wanted to find out - why were some wedding suppliers doing better than others? And so I researched all the things that made a difference to the type of advertising on blogs that worked. ...then find out below how you can attract more brides and couples to your business today! Just an advert is ‘hopeful’ marketing. Creating a multi-layered campaign over time is ‘realism’. Our Banners aren’t just a pretty photo. We include a feature all about you, though where we differ from other blogs is that you are the writer. Because in our experience, you know you the best. You know your USP. You know what makes you unique and so you get to write all about you in what ever manner you choose, this way our crowd gets to know you properly. There’s no point in us in writing a fluffy feature when we don’t know you best. Of course I will introduce you in my typical Alice style manner, but I want to work with you in creating your feature, that not only stands out, but that gets instant likeability. Layering the Banner with your article and our other ‘layering’ features creates a 3 point dynamic weave of who you are, what you do and your benefits. This ensures you have at least 3 points of ‘visibility’ at anyone time giving you maximum coverage and maximum results. As you work with us and submit more articles these layer it on even more. 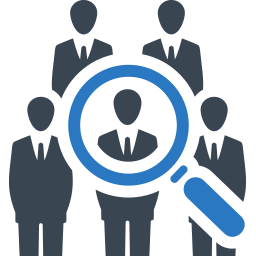 Every business has a ‘leads database’ of clients and prospects. If you have no way of ‘starting’ this relationship online by capturing the interest of your potential clients and entering into this ‘pre-dating’ relationship – then you’re just hoping someone will love you for how you look! You need to build up ‘leads’!!!! Allows you to start a dialogue ‘relationship’ by capturing peoples email addresses (because it’s the ONLY consistent way of continually creating a conversation that uses the least amount of time) Facebook, Twitter SEO (Google etc) are unreliable and inconsistent ways of ‘dating’. Sponsoring with Alice in Weddingland has proven to be a valuable source of enquiries for RSVP Candy, delivering targeted leads for our business time after time. Their dedication and helpfulness to us as an advertiser has been excellent. We use our multi-layered and multi-channel promotional outlets where you’ll reach far and deep into where your brides and couples hangout. 54% of visitors are from the UK. 24% from the USA 12% from Australia and the balance made from other countries. 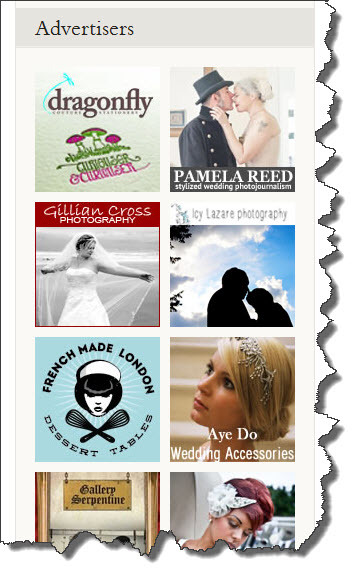 Royal Banner Adverts - Using visual media to promote you and your product across every page to your brides and couples. Situated on our prime real estate this full media marketing space is the optimum place to be. Even if a reader doesn't read a full article statistics show that the majority of web browsers are 'scrollers' and will scroll to the end of the page. This means your banner has the biggest potential to be seen. Use this as a way to capture someone's details so that you can build your own email database. 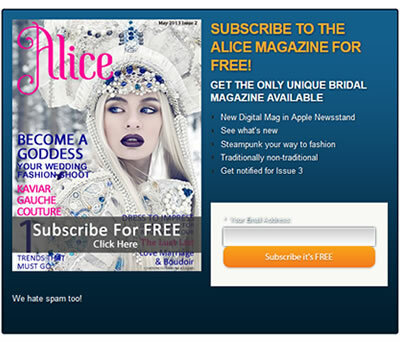 Without any promotion other than the banner you see above placed throughout the site, the Alice Magazine has built a database of over 100o+ subscribers in just 1 year. This is your golden nugget. The Heralds Post - Fascinate with your story, entice with your imagery, mesmerise with emotions. Evoke passion and wanting across the most powerful media possible. Pen your piece, Video your piece, Draw or photograph your piece - or all 3! Each peice is crafted to showcase what you've written or produced. I was overwhelmed by how many emails I received that day from people who had read the post and just wanted to get in touch. I was dealing with a new enquiry within the hour. 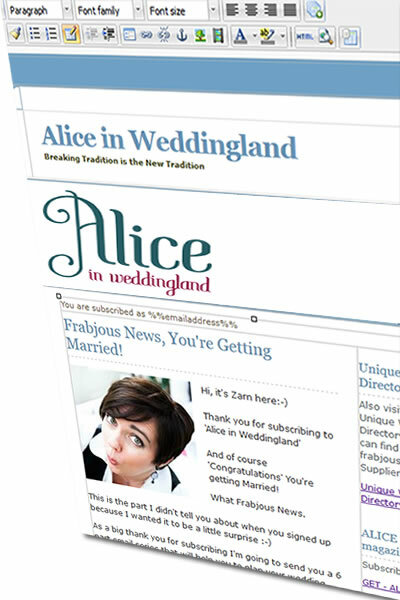 Zarns journalistic touch instantly drew me to Alice in Weddingland as a fan. She has a very personal way of writing which makes you feel that she is totally invested, it makes you curious to find out more. When she offered me some advertising space it was an easy decision for me. Dream Email - Land immediately in the inbox of Alice Brides. Discover 'razor-sharp' targeting that gets you straight to the buyer everyday. No 'hopeful' marketing - this is where it's at. The marketers dream. The Queen's Little Black Book Page - Be Seen, Be Found, Get Booked. A Unique page where we'll showcase you and your business with your favourite image, bio and keyword rich link. Your Bio - With every sponsored post you'll also have an author bio attached to the end of your post - and if you've written other articles it will also link to these too, showcasing even more of you and your business. As you can see, each of these promotional activities are really powerful in their own right and so when you combine them to influence an even greater coverage, you create the magic bullet that 'magnetic attraction'. This is because the more 'pulls' you have the more your business is brought to the front of the mind of your potential client. And so an article with a banner with email marketing is like racing a thoroughbred in the donkey derby! This is why we've created different combinations to suit even the most budget conscious person, while still giving you the thoroughbred Knights choice. Alice In Wedding Land is the place to watch if you want to find out how to add the whimsy and beauty that comes to visit truly magical weddings, and of course it's not all about the bride, Zania of course has a jewel box full of treasures for the groom too. It's worth visiting just to appreciate the talent of the photographers that she uncovers, the site is pure eye candy. Your purchase is 100% Risk Free. If you're not happy with Alice in Weddingland's Advertising Options for any reason, simply let me know within 14 days of purchase (via email) and I'll happily refund your money. If you have a Blog, sell your products or services digitally or on paper medium, then you need to know what to write, how and to whom. If you struggle writing good copy, don’t know how to SEO, nor make webpages ‘sell with sizzle’ on their own and would don’t have £1500 to spend on a professional copywriter – then these videos are for you. Do you spend too much time on marketing, or not enough? Do you find it complex. Stuck with all the different promotional activities and just feel overwhelmed and end up putting it aside or just plain giving up. While in the meantime your bank balance is suffering. In these videos you’ll discover the only 3 places where you’ll ever need to spend your marketing time. Understand what they are and whether you’re spending the right amount of time in each of them, or that maybe there’s only the one place where you need to be. Free yourself from the shackles of marketing and sales by knowing where you should be spending your time that gives you the most amount of return for the smallest amount of time. 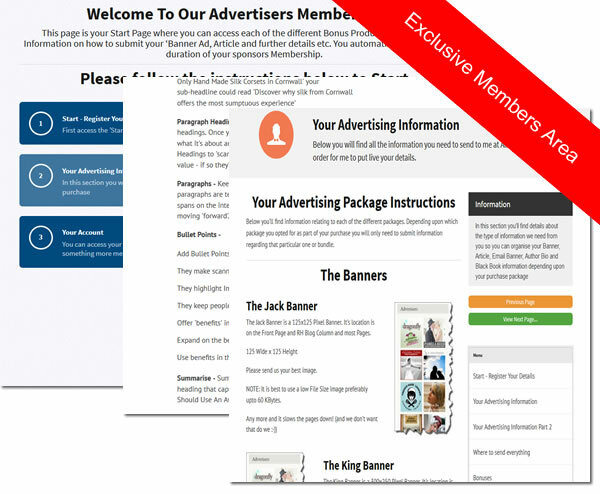 The Secret Area Where You Learn How To Create Winning Ads & Posts + a lot more! 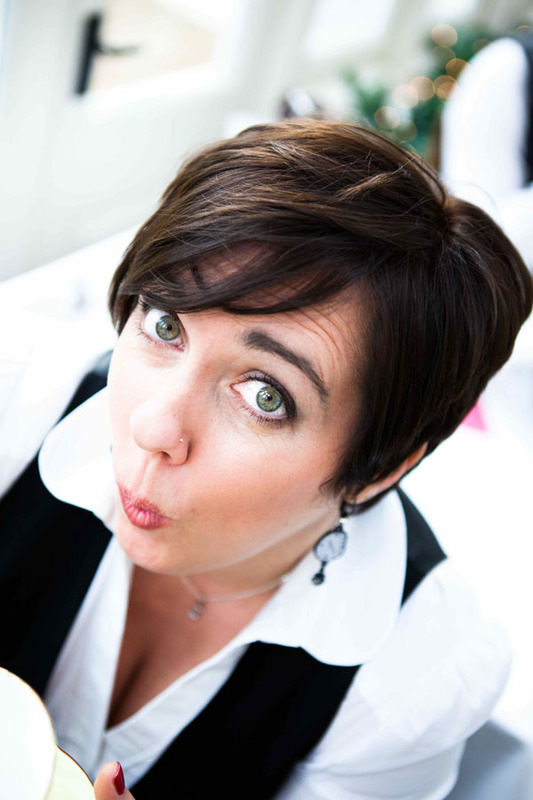 Author Bio to tell brides and couples about you! If for any reason you are unhappy or dissatisfied during the 14 days after you sign up, just contact me on my email address and I promise you will receive a full unequivocal, no questions asked full refund. This way I take all the risk from you and allow you the peace of mind and comfort in knowing you’ve made a wise investment to increase your business and get more clients. You'll be transferred to our automatic payment system where you can pay either via PayPal or if you're not a PayPal user you can pay via - credit/debit card. Once your purchase is complete you'll be transferred to your member area where you'll be given instructions in how to send through your details related to the purchase option you chose. You'll also be given access to the 2 Bonus offers. Simply Choose Your Preferred Option Below Then Click The 'Buy Now' Button. Q.Will this help me get new clients? A.There’s no magic bullet or ‘click’ button that’s going to work for anyone. 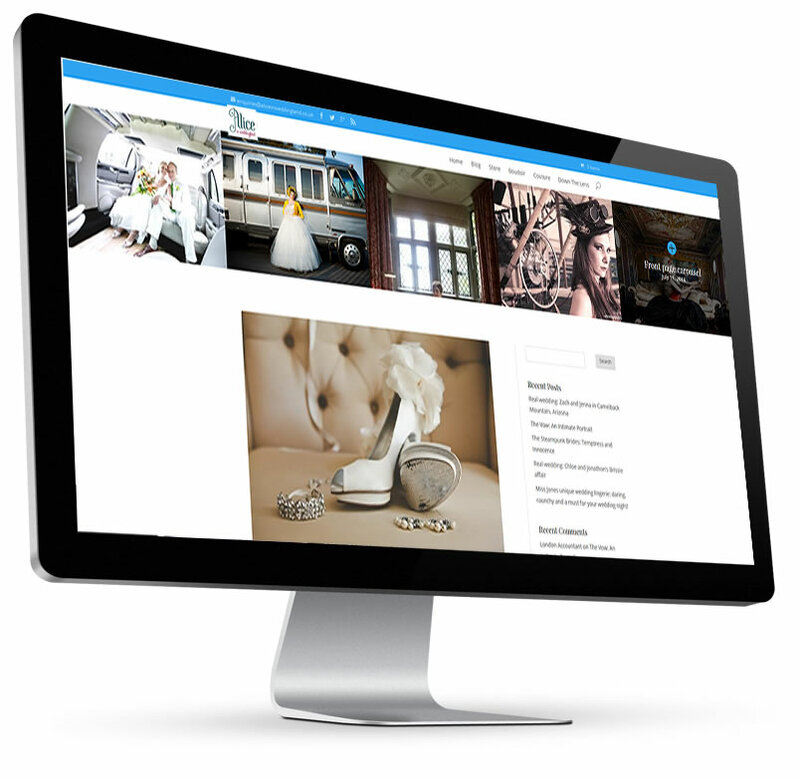 However by having a clear strategy and utilising Alice in Weddingland as a hub for where Brides and Couples come to you’ll get maximum exposure for your business. Q.What if I don't get any clicks? A.No-one can promise a banner will be clicked, that’s why we’ve cross marketed it with your our other multi-channel marketing products to ensure you get maximum exposure. Not everyone clicks first time. Many people come back or do a search on the search engines later for your business. Cross pollinating your business dramatically reduces the ‘lonely banner’ syndrome! Q.Will my Black Book listing be easy to find? A.We want you to be found. The Black Book listing will be a prominent feature of the new site with a BIG Banner on the right hand side of every blog post as well as a front page Large Banner to advertise the page. We can confidently say this is probably the most comprehensive and full featured marketing promotion package in the wedding industry. Q.How long is the subscription for? Q.Can I unsubscribe at anytime? A.You can unsubscribe at anytime though your banner and details will remain active for the 3 month period. If you wish to remove them for what ever reason just email me. You can cancel your subscription at PayPal at any time this will stop any future payments going from your account. Though if you wish to re-subscribe we can’t promise that the price will be the same. We recommend leaving until at least a week before it’s due to commence then you can see how well your marketing efforts have been. Q.Why do you offer a subscription and not just a one off payment? A.Because we cannot guarantee the price will be the same if you decide to come back at a later date. This way you also get to take advantage of a discounted subscription rather than paying full price later. Q.Will I get a new Sponsored article when the auto subscription starts? A.The sponsored article (Heralds Post) is just for the 3 month bundle. If you’d like to arrange another one to boost your profile even more we are more than happy to find a price that is agreeable as you’ll be a Alice in Weddingland member. Q.Can I change my banner at anytime? A.Yes we allow at 2 changes during your subscription period. Any more will be charged at £25 per change to cover administration costs. Q.Can I change my Author Bio, Article or Black Book entry at any time? A.These can be changed only once. Any further changes will incur a fee of £25 per product to change to cover administration. If there are spelling mistakes, wrong URL links that don’t work or punctuation errors these will be fixed free of charge. Q.Will you 'boost' my post on Facebook? To organise one of these ‘Boosted’ Posts contact me to discuss – It’s alot more affordable than you think and can make a dramatic difference.